Welcome to a great National Park experience! Zion Ponderosa Resort sits at 6,500′ above sea level. Our 4,000 acre ranch and resort is part of a large forested plateau that borders the eastern edge of Zion National Park and just a short drive from Bryce Canyon National Park. Click here to see an aerial view of Zion Ponderosa and Zion National Park. 3 Hours from Las Vegas, 4.5 hours from Salt Lake City, 1.75 hours from St. George. Alternate southern route around Zion National Park. Good for after hours travel for RV’s, or for those who wish to circumvent the park. Passing through Zion Tunnel: When traveling from Springdale to Zion Ponderosa, through the park, anticipate daytime waits to go through the mile-long tunnel. Alternate Route: There is an option of traveling a southern route through and area called Kane Beds, or through Kanab, Utah, which routes you around Springdale and Zion National Park, rather than going through. See our directions section below for other route information. Zion National Park and Bryce Canyon National Park are located in the Western United States, in the southwest part of the state of Utah. Zion National Park is Utah’s oldest national park and one of the most popular parks in the country. The red and white sandstone formations within Zion National Park stretch thousands of feet above the valley floor and offer magnificent views. It’s no mistake that Zion Ponderosa Ranch Resort is located amidst America’s highest concentration of natural scenic wonders. Property Map – close-up view of main lodging and activity areas. Please note that the North Fork road that leads to our location is a fine paved road, and we are blessed to be in a pristine and somewhat remote area. The closest airport for airline passenger service to the Zion National Park area is located in St. George, Utah. Daily flights connect to St. George from Denver and Salt Lake City, and soon from L.A. Jet and plane service is provided for United and Delta Airlines by Skywest Airlines, one of America’s finest regional air companies. Las Vegas International Airport is 3 hours (driving), and Salt Lake International Airport is 4.5 is approx. hours drive time. Please note that you will want to rent a car from any of these airports, as there are not shuttles that will transport you to our location. Car Rental: There are many national brand car rental companies located either in St. George, Las Vegas, or Salt Lake City. Shuttle: Excellent shuttle services are available from Las Vegas Airport to St. George, and arrangements can be made for transportation from St. George to Zion Ponderosa through companies such as St. George Shuttle. Directions from I-15: Take scenic Highway 9 to route marker #46 just 2 miles outside the east gate of Zion National Park. Then turn north on the paved North Fork Road. Follow the signs along the very scenic drive (just five miles) to Zion Ponderosa Ranch Resort. You Can’t Miss It!… The next map is a closer view of the North Fork road. You’re welcome to print this page for use as you travel. Take I-15 North to St. George, Utah. Approximately eight miles north of St. George, leave I-15 at exit #16 (right/east) to Highway 9 (the Hurricane / Zion National Park exit) Follow the signs to Zion National Park. Enter the Park, go through both tunnels, exit the park on the East side. Drive two miles and watch for North Fork Rd. on the left side of the road. Turn left onto North Fork Rd. and drive five miles. (see above maps). Google Maps Link. Directions From Northern Utah on Interstate 15: You have two options. a- The Shortest Travel Time – Come south of the town of Beaver on I-15 to Highway 20 (exit 95). You will turn to the East (left on the overpass) and follow this road approximately 20 miles. At the junction of Scenic Highway 89 you will turn right (south) and go seven miles to the town of Panguitch. In downtown Panguitch at the main intersection you will turn left (East) to stay on highway 89. Continue on highway 89 south for approximately 50 miles to Mount Carmel Junction. Here you will turn right onto Scenic Highway 9. You will travel 11 miles to the turn (North Fork Rd – turn right) to travel to Zion Ponderosa. Then follow this road for five miles to our main gate. (see above maps) Google Map. 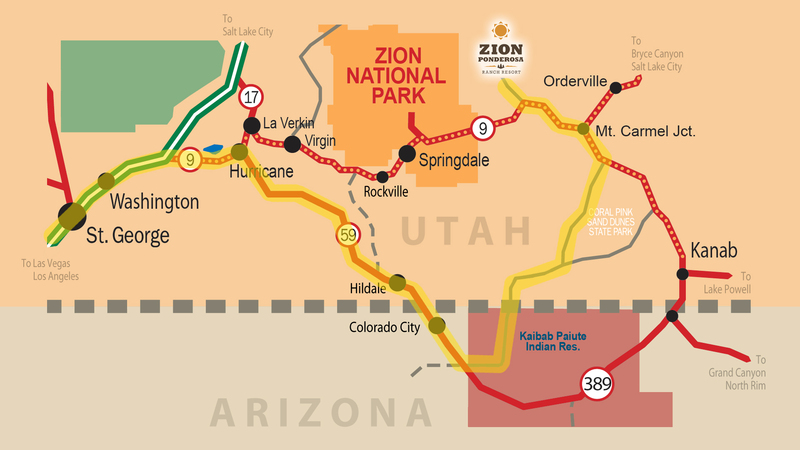 b- Scenic Route through Zion National Park – Take I-15 south to the Toquerville / Hurricane (#27) exit. Travel 10 miles through Toquerville on Highway 17. Turn left on Highway 9 and follow the signs to Zion National Park. Enter the Park, go through both tunnels, exit the park on the East side. Drive two miles and watch for North Fork Rd. sign on the right. Turn left onto North Fork Rd. and drive five miles. (see above maps) Google Map. Go west on 70 to Grand Junction, Colorado. Continue west on 70 past Richfield, Utah to the small community of Sevier. Turn south (left) on Highway 89. Go south through Panguitch, Glendale, Orderville and Mt. Carmel. Turn right at Mt. Carmel Junction and follow highway 9 for approx. 14 miles to the North Fork Rd. Turn right on North Fork Road and go five miles to Zion Ponderosa. Google Map. North on 17 to Flagstaff, then follow 89 north from Flagstaff to Marble Canyon. Cross Navajo Bridge and go west to Jacob Lake and then follow 89 north through Fredonia, Kanab and to Mt. Carmel Junction. At Mt. Carmel Junction turn left (west) and follow Highway 9 for approx. 14 miles to the North Fork Rd. Turn right on North Fork Road and go five miles to Zion Ponderosa. Google Map.